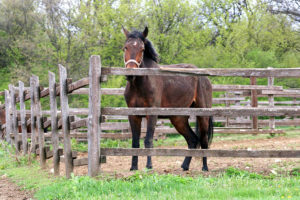 In January, four horses in Rutherford County, Tenn., were euthanized after contracting equine infectious anemia (EIA). Six other horses were quarantined after an initial negative test, pending a second test. Such incidents highlight the reasons equine veterinarians should be vigilant in their surveillance for this incurable viral disease. In fact, in 2017, 80 EIA-positive horses were identified in the U.S., with 38 premises testing positive for the disease (Figure 1). EIA is a viral disease affecting only members of the equidae family (horses, ponies, zebras, mules, and donkeys). It is caused by an RNA virus from the Lentivirus, a genus of Retroviridae. EIA remains an uncommon, albeit persistent problem both in this country and abroad. While EIA is not a direct threat to human health, it is a reportable disease in all the U.S. The most important mode of transmission of EIA is via blood-feeding insects, especially biting flies such as horse flies, deer flies, and, possibly, stable flies. Horses may react strongly to biting flies; their defensive behaviors can interrupt feeding by the insect. This makes the flies particularly efficient transmitters of EIA because when a horse reacts, the fly typically moves on to another one. Viral replication does not occur in flies; virus-infected blood is transferred between horses, usually those in close proximity to each other. The likelihood of a horse being infected is directly related to how much blood remains on the mouthparts of the insect after a meal. While EIA is typically considered a blood-borne infection, in fact, all the horse’s body tissues and fluids have the potential to be infectious, especially when virus levels are high during clinical disease episodes. Blood-contaminated syringes, needles, or surgical equipment also can easily transmit the disease, as can transfusion of infective blood or blood products. It is possible, although rare, for a pregnant mare to transmit the disease to her fetus during pregnancy. What are EIA’s clinical signs? Clinical signs of EIA can vary, depending on the virulence and strain of the virus, the infective dose, and the horse’s own susceptibility. The disease may be acute or chronic. The severity of clinical signs has a direct relationship to the amount of virus present in the infected horse. Incubation can take two weeks to two months. The disease typically progresses through phases. The fact there is a highly variable response to the virus in natural cases of infection makes it impossible for a diagnosis of EIA to be confirmed based solely on clinical signs. Annual total number of equine cases of EIA and number of affected premises in each state from 2001 to 2017. Typically, the initial acute phase of EIA lasts one to three days. The clinical signs include fever, depression, and thrombocytopenia. However, signs may be mild and inconsistent and therefore, may be overlooked. On the other hand, some outbreaks of EIA with high levels of uncontrolled virus as associated with a very high fever, severe thrombocytopenia, depression, and death. Following the initial phase, EIA infections typically cause a prolonged period associated with episodic clinical signs more typically associated with the disease, including recurrent fever, anemia, petechial hemorrhages on mucous membranes, edema, muscle weakness, and muscle wasting. Episodes may occur within days, weeks, or months of each other. Subsequently, episodes of clinical disease usually stop within a year of infection; however, infected horses usually become chronic. After clinically apparent disease subsides, infected horses become inapparent carriers and reservoirs of the EIA virus. Although some chronic cases may appear normal, other infected horses may be emaciated, anemic, or have pale mucous membranes with or without petechial hemorrhages. If a horse is suspected of having EIA, the diagnosis must be confirmed by showing viral antibodies in blood. For several decades, the standard for diagnosis was the agar-gel immunodiffusion (AGID) test named after the late Leroy Coggins, DVM, PhD. Various enzyme-linked immunoassay (ELISA) tests also are available and may provide faster results. That said, ELISA tests have a higher rate of false positives, which means positive results from ELISA tests must be confirmed by the Coggins test. The highest level of diagnostic sensitivity and specificity occurs when the tests are run concurrently. Unfortunately, if tests are run within the first 10 to 14 days of infection, false negatives may occur; in some cases, seroconversion has occurred ≥ 90 days. Veterinarians should be aware foals of seropositive mares may acquire maternal antibodies to EIA after ingesting colostrum. Passive antibodies are typically no longer detectable after six to 12 months, depending on the testing method used. There is neither a specific treatment for EIA nor a safe and effective vaccine. In the U.S., seropositive horses must be placed under quarantine within 24 hours after positive test results are known—the quarantine area must provide separation of at least 183 m (600 ft) from all other equids. The U.S. Department of Agriculture (USDA) must oversee management of EIA horses. Additional information on USDA requirements can be found at bit.ly/2E3QcQW. The only known source of EIA infection is other infected equids. While it is not possible to determine the risk posed by any particular infected horse, the virus persists, and viremias may wax and wane. As a result, infected animals are required to be kept at least 183 m (600 ft) from other horses. Most regulatory agencies assume any horse with EIA is a high risk animal. Horses with unknown EIA status should not be comingled. It is important to follow good hygiene practices when dealing with EIA-positive horses. For example, needles and other medical supplies should never be shared between horses. In addition, environmental control to reduce biting flies by application of insecticides and various environmental strategies also is warranted. Many states require all horses be tested annually for EIA (using the Coggins test); in endemic areas, more frequent testing may be warranted. Of course, EIA tests are required for interstate or international transport of all horses, before many shows, or before going to sale, no matter from which state they originate. David W. Ramey, DVM, is a Southern California equine practitioner who limits his practice to the care of performance and pleasure horses. Visit his website at doctorramey.com. Columnists’ opinions do not necessarily reflect those of Veterinary Practice News.